Plants are one of five big groups (kingdoms) of living things. They are autotrophic eukaryotes, which means they have complex cells, and make their own food. Usually they cannot move (not counting growth). Plants include familiar types such as trees, herbs, bushes, grasses, vines, ferns, mosses, and green algae. The scientific study of plants, known as botany, has identified about 350,000 extant (living) species of plants. Fungi and non-green algae are not classed as plants. Most plants grow in the ground, with stems above, and roots below. Water and some nutrients come from the roots. The evaporation of water from pores in the leaves pulls water through the plant. This is called transpiration. A plant needs sunlight, carbon dioxide, minerals and water to make food. A green substance in plants called chlorophyll traps the energy from the Sun needed to make food. 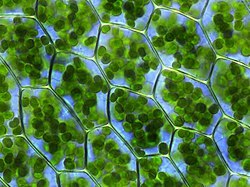 Chlorophyll is mostly found in leaves, inside plastids, which are inside the leaf cells. The leaf can be thought of as a food factory. Leaves of plants vary in shape and size, but they are always the plant organ best suited to capture solar energy. Once the food is made in the leaf, it is transported to the other parts of the plant such as stems and roots. The word "plant" can also mean to put something in the ground. For example, farmers plant seeds in the ground. At least some plant cells contain photosynthetic organelles (plastids) which enable them to make food for themselves. With sunlight, water, and carbon dioxide, the plastids make sugars, the basic molecules needed by the plant. Free oxygen (O2) is produced as a by-product of photosynthesis. Later, in the cell cytoplasm, the sugars may be turned into amino acids for proteins, nucleotides for DNA and RNA, and carbohydrates such as starch. This process needs certain minerals: nitrogen, potassium, phosphorus, iron and magnesium. Plant nutrition is the study of the chemical elements that are necessary for plant growth. The roots of plants perform two main functions. First, they anchor the plant to the ground. Second, they absorb water and various nutrients dissolved in water from the soil. Plants use the water to make food. The water also provides the plant with support. Plants that lack water become very limp and their stems cannot support their leaves. Plants which specialise in desert areas are called xerophytes or phreatophytes, depending on the type of root growth. Water is transported from the roots to the rest of the plant through special vessels in the plant. When the water reaches the leaves, some of it evaporates into the air. Many plants need the help of fungi to make their roots work properly. This plant/fungi symbiosis is called mycorrhiza. Rhizobia bacteria in root nodules help some plants get nitrogen. Flowers are the reproductive organ only of flowering plants (Angios). The petals of a flower are often brightly colored and scented to attract insects and other pollinators. The stamen is the male part of the plant. It is composed of the filament (a stalk) that holds the anther, which produces the pollen. Pollen is needed for plants to produce seeds. The carpel is the female part of the flower. The top part of the carpel contains the stigma. The style is the neck of the carpel. The ovary is the swollen area at the bottom of the carpel. The ovary produces the seeds. The sepal is a leaf that protects a flower as a bud. The process by which pollen gets transferred from one flower to another flower is called pollination. This transfer can happen in different ways. Insects such as bees are attracted to bright, scented flowers. When bees go into the flower to gather nectar, the spiky pollen sticks to their back legs. The sticky stigma on another flower catches the pollen when the bee lands or flies nearby it. Some flowers use the wind to carry pollen. Their dangling stamens produce lots of pollen that is light enough to be carried by the wind. Their flowers are usually small and not highly coloured. The stigmas of these flowers are feathery and hang outside the flower to catch the pollen as it falls. A plant produces many spores or seeds. Lower plants such as moss and ferns produce spores. If all the seeds fell to the ground besides the plant, the area might become overcrowded. There might not be enough water and minerals for all the seeds. Seeds usually have some way to get to new places. Some seeds can be dispersed by the wind or by water. Seeds inside juicy fruits are dispersed after being eaten. Sometimes, seeds stick to animals and are dispersed that way. The question of the earliest plant fossils depends on what is meant by the word "plant". If by plants we mean phototrophs using chlorophyll, then cyanobacteria in stromatolites are the first fossils, 3,450 million years ago (mya) in the Archaean eon. The remarkable precision is possible because the fossils were sandwiched between lava flows that could be precisely dated from embedded zircon crystals. Acritarchs (a group of organic-walled microfossils) may be reproductive cysts of green algae. If so, they are present in the Neoproterozoic era, 1000 mya. Otherwise, there is a large increase in planktonic algae around 540 mya in the Cambrian period. If by plants we mean land plants, the first fossils are in the Silurian. By the Silurian, fossils of whole plants are preserved, including the lycophyte Baragwanathia longifolia. From the Devonian, detailed fossils of rhyniophytes have been found. Early fossils of these ancient plants show the individual cells within the plant tissue. The Devonian period also saw the evolution of the first tree in the fossil record, Wattezia. This fern-like tree had a trunk with fronds, and produced spores. The Coal measures are a major source of Palaeozoic plant fossils, with many groups of plants in existence at this time. The spoil heaps of coal mines are the best places to collect; coal itself is the remains of fossilised plants, though structural detail of the plant fossils is rarely visible in coal. In the Fossil Forest at Victoria Park in Glasgow the stumps of Lepidodendron trees are found in their original growth positions. Wikispecies has information on: Plantae. ↑ Asimov, Isaac 1968. Photosynthesis. Basic Books, New York, London. ISBN 0-465-05703-9. ↑ Smith A.L. 1997. Oxford dictionary of biochemistry and molecular biology. Oxford University Press. p508 ISBN 0-19-854768-4. "Photosynthesis -- the synthesis by organisms of organic chemical compounds, esp. carbohydrates, from carbon dioxide using energy obtained from light rather than the oxidation of chemical compounds". ↑ Mauseth, James D. 2003. Botany: an introduction to plant biology. Jones & Bartlett, Boston. ↑ Pous, Dinora. Science and plants. Blue Planet. ↑ Lewis L.A & R.M. McCourt 2004. "Green algae and the origin of land plants". American Journal of Botany 91 (10): 1535–1556. http://www.amjbot.org/cgi/reprint/91/10/1535?maxtoshow=&HITS=10&hits=10&RESULTFORMAT=&searchid=1&FIRSTINDEX=0&sortspec=relevance&volume=91&firstpage=1535&resourcetype=HWCIT. This page was last changed on 9 October 2014, at 22:48.